When Elizabeth Scott ordered her new energy-efficient home, a factory in Searsmont, Maine, went to work. 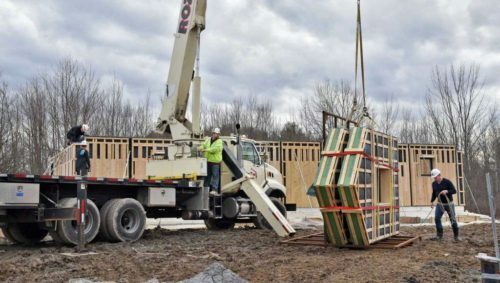 The house arrived in pieces on four trucks in rural Guilderland at the beginning of March. A team of workers unloaded the wall and roof sections on a Wednesday, hoisting them into place on the previously poured foundation. By Saturday, the house was mostly assembled, and finishing work, including plumbing and electrical systems, has since begun. For Scott, an energy-efficient home is nothing new. Her parents live in a solar house designed by Adirondack Alternative Energy’s Bruce Brownell back in 1979, which stands a short distance from Scott’s home. But that was a custom design. 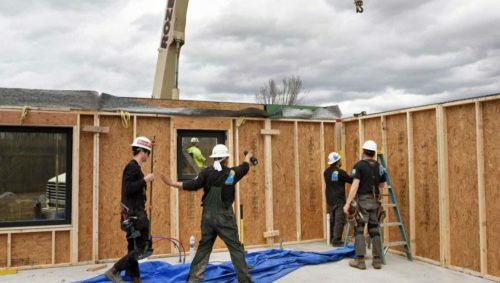 “I was waiting to see who could do a prefab-type home,” Scott said as workers hoisted the panels behind her. 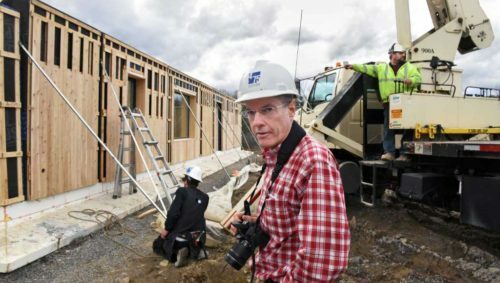 Enter Milford, Pa.-based passive house architect Richard Pedranti and Chris Corson, founder and technical director of Searsmont, Maine-based passive house components manufacturer Ecocor. The Guilderland house was the first completely prefab house the partnership between Pedranti and Ecocor has produced. Pedranti worked with Scott over a six-week period, customizing her model home. The computerized design provided instructions to the automated production line, where programmed saws cut pieces to be assembled and finished at the factory — a four- to six-week process — before the 6,200 components were ready to be loaded onto trucks for delivery. Scott worked with Pedranti to convert what would have been an attic to additional living space, giving her room for her jewelry design workshop and producing a one and a half story house that has four bathrooms and three bedrooms. Construction costs were about $237 per square foot. But the house is projected to cut energy consumption by 80 to 90 percent, with annual heating and cooling costs falling to $200 a year. 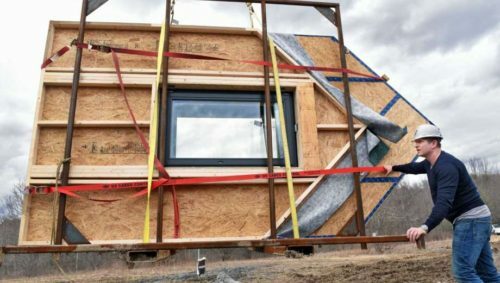 The panels in the passive house that Scott will live in are packed with cellulose insulation, wrapped in a Gore-tex “jacket,” with 18.5-inch-thick walls and efficient windows. The completed building is airtight. A heat recovery ventilator brings in fresh air while transferring the heat from the air being exhausted. Pedranti and Ecocor have nearly a dozen different models, ranging from a ranging from a one-bedroom, one-bath model for $152,000 to a three-bedroom, two and half bath model, with 1,932 square feet of interior space, for $496,000. Corson said he expects prices will come down as more of the houses are produced. Much of the technology was first developed in Europe, said Scott. 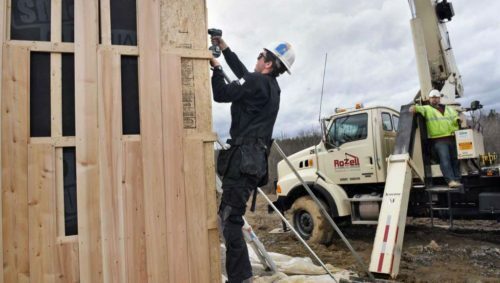 It’s only in recent years that the technology — including computer numeric controlled (CNC) saws — has been used to produce the panels, which are machined to within 1/64th of an inch. Scott considered retrofitting an existing house to achieve the energy efficiency she was seeking but decided against it. 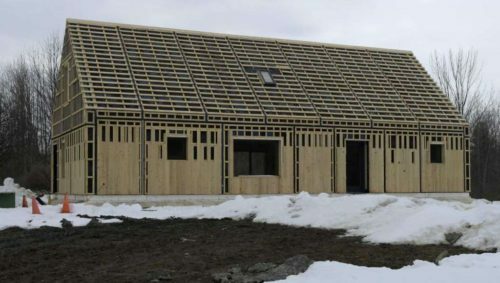 The new house, sitting on a slab that’s insulated from the earth below, offers the quality control, precision and guaranteed levels of air tightness that Scott was looking for, said Corson. 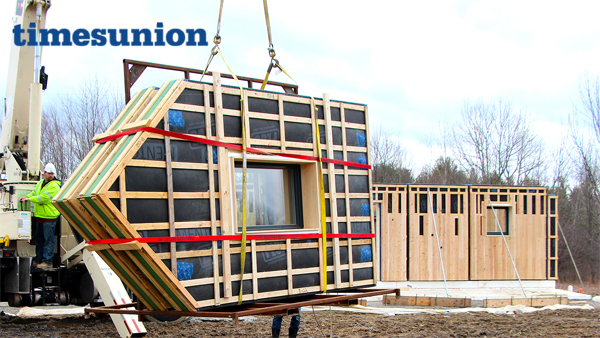 See this article on http://www.timesunion.com/tuplus-features/article/Prefab-home-offers-energy-efficiency-11025212.php.